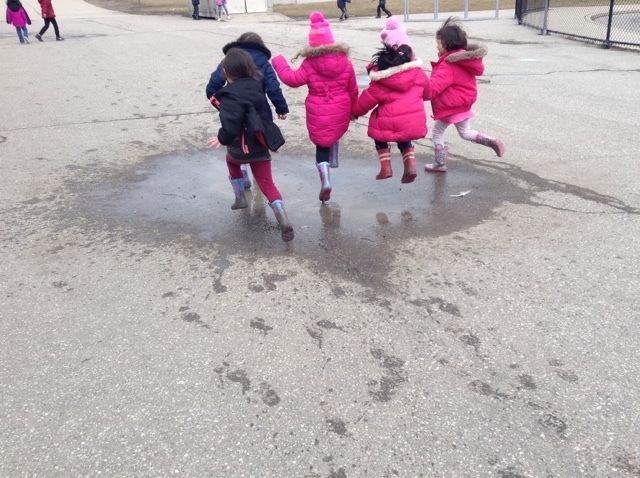 Students in rubber boots may explore the otherwise "off limits" (to the big kids at recess) muddy puddle just outside of our yard. 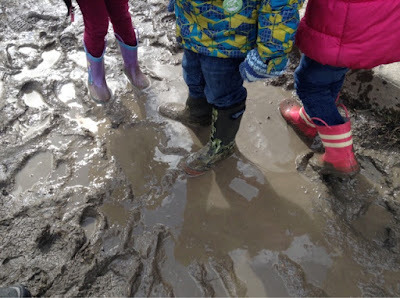 These three made many observations about the quality of the mud: sticky around the edges, splashy in the deepest section, squelchy when boots were dug in deep, "creamy" like coffee, slippery when dragged along the dry pavement. The weather has changed drastically these past few weeks. 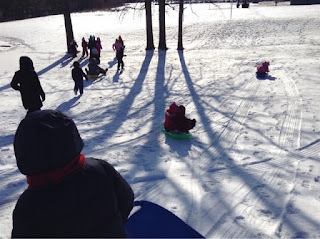 We've gone from sledding to puddle-stomping to listening for returning birds, all in March. This time of year the season's cycle seems to affect kids of all ages, whether in anticipation of March Break or simply something ancient in us that responds to the longer days much like flora and fauna around us seem to sing with spring. Inside inquiries (rolling, balance, creating noise and music, exploring number patterns, and more) seem to hold interest for less and less students, and thus we naturally respond by looking around the room for what we educators may move, remove, or enhance. Outside, the world is in a state of rapid change that is near impossible to ignore. A glorious day at the end of February. We spent a happy afternoon exploring a fresh snowfall. March brought a wondrous new snowstorm, providing our class fresh material to explore in new ways - a large group of us played at this tunnel, big enough for a kindergartener to slide or shimmy through, and sturdy enough to walk upon the bridge (though we only tried one action at a time in case the snow bridge collapsed). 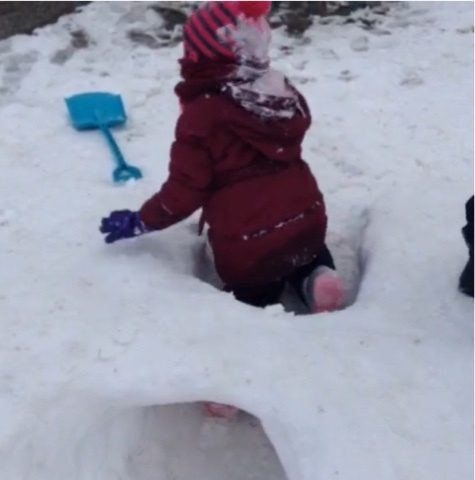 The next week at school followed an unseasonably warm weekend, melting all but a few large piles of snow which continued to melt into rivulets and trickle down the sloping tarmac into several drains. Our favourite puddle was back. This year we have had flora growing in the classroom, from our usual green plants to our more recent "garden with and without soil" under the big windows. It began with a spark, one student's idea back in December. She'd brought her gardening tools to school and showed them to Pooneh, who encouraged her to draw up a plan for how we might start a garden in the new year, as it was close to the winter holiday. Upon returning in January, we noticed our classmates down at the far end of our pod, room 105, had started a window garden with vegetable scraps and herbs. This reminded me that we had a sprig of mint that had been sitting up on our windowsill all winter, quietly growing roots in the jar of water it was in, hidden by the bigger plant in front of it. It all came together perfectly to engage more students in FC's gardening plan. With visits to our friends down the the end of our pod in room 105 for inspiration, Pooneh and a group of students started a gardening centre under our windows. It began with scraps of vegetables in water (onions, garlic, carrots, anise, herbs), then some flower seeds I'd saved from my mother's garden, then finally beans (by request by students who remembered growing and eating our beans last year). The tweet above shows what inspired us to take a group of students to visit Lada and Carmen's class, to see how they were investigating growing in a different way than FC had drawn up in her plan. A small group went to see it with Pooneh and were excited about what they saw. 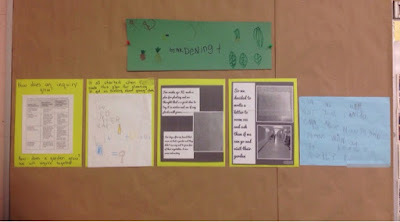 We started a documentation space to share the story of the garden, first with these few images and the letter three students wrote to the Kindergarten friends in room 105, requesting a visit to see their garden. 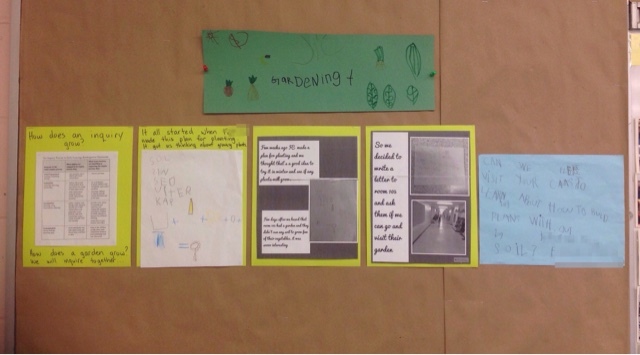 As our garden began to grow, this space filled with their drawings and observations of the vegetables and herbs. It is now full, leading us to prepare a book for further entries so that we can add to it daily and have a place for students to look over the shared documentation. Students definitely show interest in the changes they see at this table, but gardening is patient work. Students visit the garden each day, and may talk about or draw what they see, touch the plants, even ask questions... but longer exploration and play doesn't usually happen here. A moment of longer engagement with the gardening centre - perhaps because mint is such a delightful smell, students spend time picking leaves to rub between their fingers to release the heady scent. AC noticed something unusual in the pattern of the leaves while she looked closely to the details in order to draw the fallen and picked leaves. Gardening is patient work, but harvesting or exploring the end results is very inviting work - using a mortar and pestle to grind herbs or spices is always a popular choice in our class. In past years we've ground up dried leaves and flowers for our potions centre, while this year the ground herbs have been added to the play dough we make each week with students. It adds a lovely scent and colour that is more meaningful for those who did the grinding. Nature inquiry naturally blossoms outdoors, and this time of year, as we strip off our winter warm gear, unzip our jackets, and finally feel the warmth of the sun on our hands and faces, well, this is the time that "looking closely" pays off even more than usual. Observation skills honed in the fall (those changing leaves and chilly frozen-puddle mornings), used during quieter moments outside in the winter (catching snowflakes, digging under snow to examine grass frozen under ice, listening to the creaking of trees or the shatter of icicles), these skills are naturally called upon when every day is different, such as in spring. What magical change might we see at the park? This morning, while out with my daughter and her friend, I walked under a huge maple tree that was dropping delicate flowers. I picked up a handful and carried them to a chair in the sunlight. The girls came over to see me after a playing a while. They wondered, what were these weird and wonderful things on my chair? Out of context, they were exotic. I explained that they were the first sign of spring on a maple tree, preceding leaves. That little tidbit of information was enough for me, as a child, to be fascinated with phenology (though I only learned the word a few years ago). I became enthralled with birds and trees, insects and wildflowers, and other flora and fauna around me that showed patterns over seasons that I could learn to read. Little clues tied to other little clues (blackbirds returning, maples flowering, sap running, days lengthening) helped me see the bigger picture of seasonal change in all its sensational glory. 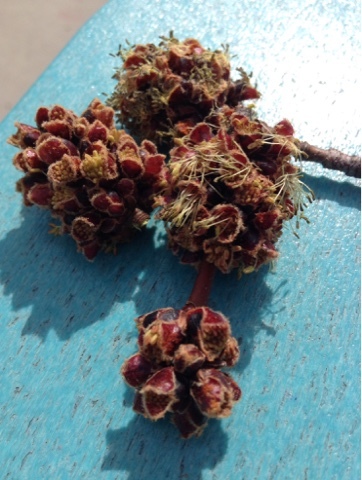 Maple flowers found nearly camouflaged on brown and green grass, looking more striking against the blue chair. This moment today brought back a phenology memory from last spring. I distinctly remembered students searching and inspecting tree blossoms - delicate, tiny things that most people don't even notice amid the brighter flowers of spring. I had created the storify story below to share with our families how students in our class were developing incredible skills in observation and deduction. 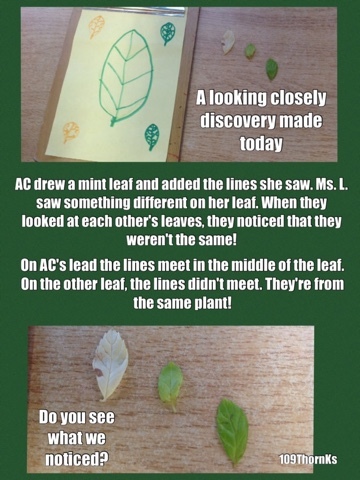 I was delighted and more than a little proud of these kindergarten scientists looking closely, noticing details and patterns in their environment, and creating meaning out of their experiences in nature. Note: an interesting twist to this story occurred to me when I looked up the storify link today. This was our first tweet from that particular class at nearby Clifton PS. Our classes were linked by a common educator "hero" to our students, Rob Ridley. His questions and focused collaborations (like #KindergartenBioBlitz and "The Lost Ladybug Project") and his thoughtful responses to our queries lead many educators to follow and "tweet the Ranger" as our students do. The teacher in this class tweeted the query to us, in particular, because she knew of our year-long focus on the skill of "looking closely". I didn't remember it until now, but that teacher was Emily Krahn. We had met and collaborated on PD a few years back, and this year she'd moved from Clifton to join our growing team at Thornwood PS (where we now have 7 K classes). Emily is now my neighbour, in the middle of our long pod classroom that begins with room 105 (where the gardening investigation so inspired us) and ends with room 109, our room. I wrote a story about making connections, and didn't even realize how connected we were. After March Break I will revisit the documentation from this day with senior students who took part in the investigation. It may well spur more phenology study amongst our newest students who've joined our class in the last few months of winter.